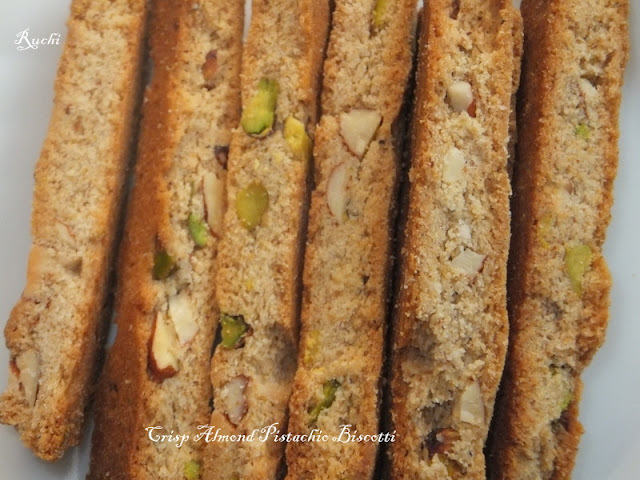 It is fun to try something new,something you've only heard about before and not tasted. . My first attempt at making biscotti and I loved every bit making them.Their texture is crisp and crunchy with an almond , flavor that comes from adding pure almond extract along with chunks of toasted and blanched almonds& pistachios. These Italian cookies make a wonderful tea-time or anytime snack. The name biscotti is derived from 'bis' meaning twice in Italian and 'cotto' meaning baked or cooked. Biscotti are twice baked biscuits. (Recipe adapted from biscotti recipes from Joy of Baking). 2.Rub the sugar and Lemon zest in a small bowl until the sugar gets moist and aromatic. 3.Sift together the flour, baking powder, and salt into a medium bowl. 4.Beat the butter and the sugar mixture in a medium bowl with an electric mixer until fluffy..
5.Reduce the speed to low, add the flour mixture . coarsed almond powderand beat just until combined. Stir in the pistachios and chopped almonds with a wooden spoon or rubber spatula. 6.Divide dough into two pieces. Form into long flat loaves about 1/2 inch tall and 12 inches long. Place the loaves 2 inches apart on the prepared baking sheet. 7.Bake in preheated oven for 25 minutes, or until a light golden brown. Remove from oven and cool on a wire rack for 5 minutes. 8.With a serrated knife, cut diagonally into slices about 1/2 inch thick. 9.Place the biscotti back on the baking sheet and bake for a second time to draw out the moisture to produce a toasted, crisp and dry biscuit. Bake for 5-7minutes, then turn slices over and bake for another few min. 10.Remove from oven and cool. As the biscotti have been baked twice, they become very dry and can be stored for a long time. The biscotti can be stored in an airtight container for 2-3 weeks. They were absolutely stunning akka, with loads of nuts,am in love with ur biscottis. 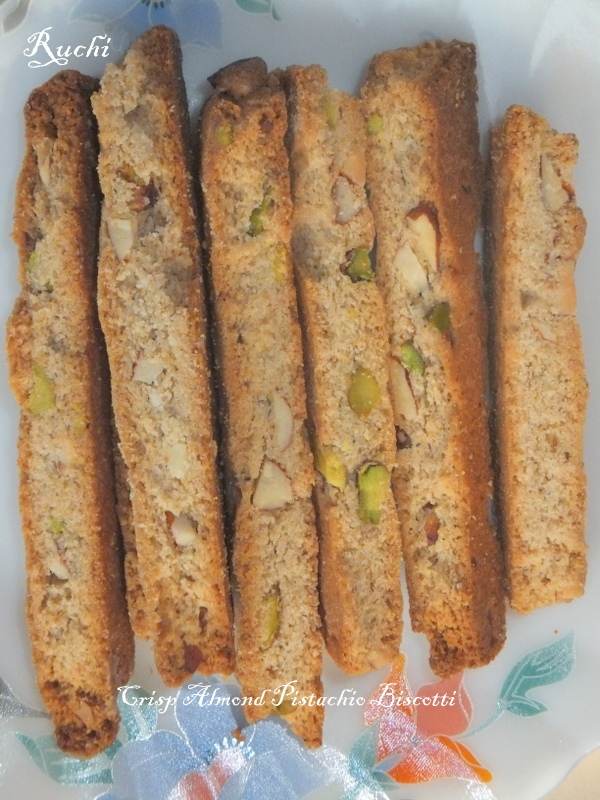 Super tempting & so perfectly made biscotti!!! I haven't tried making biscotti either. I'm inspired to do so after seeing your post.Looks delish! thnks for the recipe. leaving out orange zest ll make a difference?